Ho ho ho, and Yippee ki yay, motherf*cker! 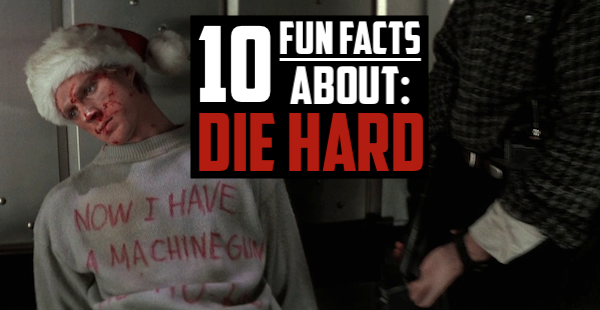 Tis the season for German terrorists, botched office parties, and one of the most badass action movies of all time: Die Hard. Even though the film was released in the summer of 1988, it's since become a Christmas staple, and it's easily one of our favorites here at Viddy Well. Since this is the season of giving and all, we decided that we'd share some of our favorite facts about the film and its production. Enjoy! The truth behind Nakatomi tower. The Nakatomi tower in the film was actually Fox Plaza in Century City, which was under construction during the time of the film's production and is still their headquarters today. The film used the unfinished building for both external and internal locations, and even charged itself rent to use it as a shooting location. Production designer Jackson De Govia devised the idea to use the not-yet-constructed headquarters as the set, and modeled the building's 30th floor (where the hostages are held) after the Frank Lloyd Wright designed house Fallingwater. Alan Rickman's big screen debut. Die Hard was Rickman's feature film debut, and he was 41 at the time of its casting. Up until that point, he had only appeared onstage and on British television. Producer Joel Silver and director John McTiernan saw Rickman play the evil Vicomte de Valmont in the play Dangerous Liaisons and knew he would make the perfect Gruber. Rickman nearly passed on the role because he was outraged that his first film role would be a villain, but he eventually came around and we know how well that worked out for him. An unheard of amount of money. Bruce Willis received five millions dollars for his role as John McClane, which was an unheard of figure for an actor who'd only starred in one moderately successful film. The monumental fee was generally reserved for the major stars and required Fox President Rupert Murdock's sign-off. The role of John McClane was offered to a slew of stars, including Sylvester Stallone, Harrison Ford, Don Johnson, Richard Gere, Burt Reynolds, and Clint Eastwood. McTiernan wasn't persuaded to case Willis in the role until some demographic data from Cinemascope revealed that he would make a good fit. The pains of achieving exaggerated realism. The firearms used in the film are real weapons modified to function with blanks, which is the standard protocol for most action films. However, due to McTiernan's request to have vivid "exaggerated realism" in the muzzle flashes, weapons specialist Michael Papac had to specially modify the firearms to discharge his powerful handcrafted blanks which were so deafening that they caused Alan Rickman (along with several other cast members) to flinch. To work around this, McTiernan was forced to cut away from Rickman whenever he fired his gun, but traces of his flinching still made it into the film — if you look at his face when he shoots Takagi you'll notice him wincing. The scene where McClane falls down the air vent shaft was a mistake by the stuntman. He was supposed to grab the first vent, but slipped and continued to fall. McTiernan incorporated the shot into the film anyways because it played into the exaggerated realism, splicing it together with a shot where McClane grabs the next vent down as he falls. Gruber's look of fear is real. To achieve Hans Gruber's death scene, actor Alan Rickman was dropped 70 feet on a green screen set, and the look of fear on his face is a genuine one. He was dropped sooner than he was expecting, and the camera caught his candid expression. Gruber's theme attributed to Stanley Kubrick. It was McTiernan's idea to have Gruber's musical theme be Beethoven's Ode to Joy (Ninth Symphony, Fourth Movement), which Gruber even hums at one point in the film. Film composer Michael Kamen wasn't convinced of the idea right away, even going so far as to say it was sacrilege to put Beethoven in an action movie. It wasn't until McTiernan reminded Kamen that the Ode to Joy had been the musical theme of "ultra-violence" in Kubrick's A Clockwork Orange that he agreed. Willis is wearing special rubberized shoes in the film designed to look like his bare feet, which added some unnatural mass that can be spotted in some of the crucial barefoot scenes, like the run through broken glass in the computer room. In actuality, only a handful of actors playing the German terrorists were German. The actors were selected for their intimidating appearances, and 9 of the 12 were over 6 feet tall. Ironically, Willis, who is sneered at for being an all-American hero by the German terrorists, was more German than the villains, having been born in West Germany. Rickman was English, and Alexander Godunov was Russian. Willis indirectly beefed up the side roles. During the film's production, Willis was simultaneously shooting for his TV show Moonlighting, which he shot during the day before coming to the Fox lot for evening shoots for Die Hard. Willis' exhaustion forced screenwriter Steven E. de Souza to beef up the roles of the other characters, which gave characters like Al Powell, Argyle, and Richard Thornburg more personality and screen time. We think that it also adds to the films comic relief and charm. That's our list! Were there any amazing fun facts we left on the cutting room floor? We want to know. Share your thoughts and feelings in the comments section below, and as always, remember to viddy well!